That is until my husband and I went to Mallorca, a Spanish restaurant in downtown Cleveland. I don’t know what got into me – I must have been feeling adventurous that evening – but I decided to try the Gazpacho. I was sold! 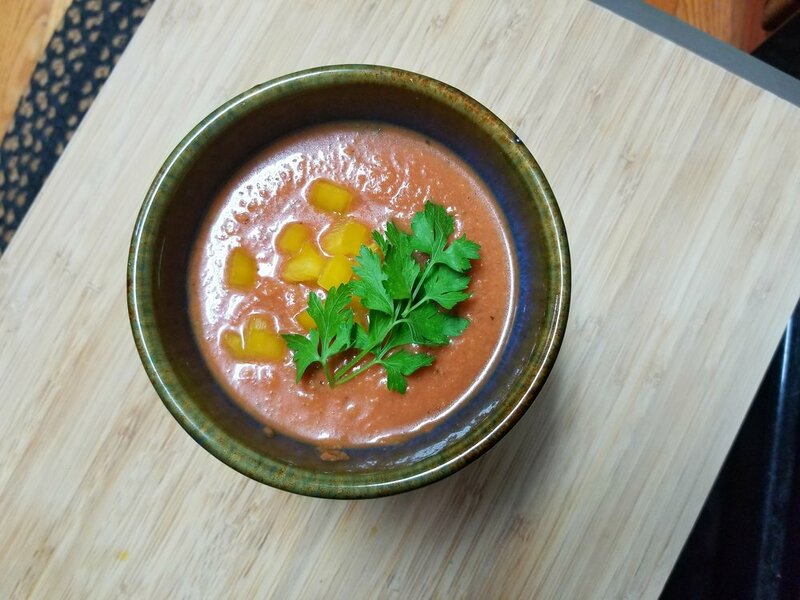 Gazpacho originated in the Andalusia region of Spain and is a cold soup made of blended raw vegetables, herbs, and spices…and it’s delightful on a hot summer day! The main challenge? Gazpacho, being a cold soup, isn't a terribly popular dish in the US and is hard to find on a restaurant menu. I’ve been to only three restaurants that had it on the menu: Mallorca in Cleveland, and two restaurants we visited on vacation in Bequia, St. Vincent and the Grenadines (Caribbean). It takes me an hour to get to C-town, and as much as I’d love to be sitting in a Bequia restaurant overlooking the Caribbean sea and eating this refreshing dish…it’s not just realistic to jetset down there for soup until I start making the big $$$. The only thing to do? Make it myself! As Matty Matheson would say…this is a “medium dog” recipe. It’s not hard to make it, but there are several steps and a lot of chopping involved. Don’t get overwhelmed…just follow the steps! Step 1: Peel and seed your tomatoes. To do this you will need to boil a large pot of water. You will also need a second pot with ice cold water. Score each tomato by taking a knife and creating a “cross” cut on the bottom. When the water in the first pot is boiling, put your tomatoes in. After 1 to 2 minutes, the skins should be starting to peel. This is when you want to put them into the ice bath. When they are cool enough to handle, slip the skins off and squeeze them to get rid of the seeds. Caution: the seeds may squirt everywhere! Get most of the seeds out and set tomatoes aside. Step 2: Chop up the rest of your vegetables and fresh herbs. Step 3: In a large bowl, toss together tomatoes, cucumbers, green bell pepper, onion, garlic, parsley, basil, oregano, olive oil, vinegar, Worcestershire sauce, lemon juice, and red pepper sauce. I used a large spoon to gently mix everything. Step 4: Using a good blender, put about half of the mixture into the blender and puree until smooth. Add the second half and pulse. I like a few veggie chunks in my Gazpacho, so I only hit the pulse button about 5 times to get the consistency I want. If you like a totally smooth soup, you may just want to puree all of it at once. Step 5: Pour mixture out of the blender and into a large bowl. Stir in the strained tomatoes, water, salt, and pepper. Step 6: Refrigerate the soup for at least 5 hours…overnight is better. The longer this soup sits, the better it is! Step 7: Taste before serving. You may want to add more lemon juice, Tabasco, salt, and/or pepper. Garnish with some diced bell pepper or a lemon wedge if desired. I'd love to hear from you! Did you make this recipe? How did it turn out?